Knoxville creative team Lynn Ahrens, Stephen Flaherty and Frank Galati. 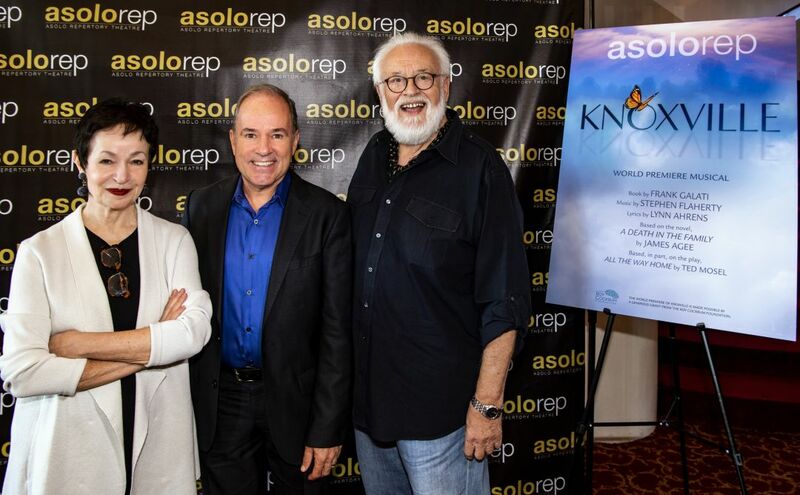 The same triumvirate responsible for the Tony Award-winning musical Ragtime—director Frank Galati, lyricist Lynn Ahrens and composer Stephen Flaherty (working also with book writer Terrence McNally on that show)—is now at work on a world premiere musical to be presented by Asolo Repertory Theatre in the spring of 2020. Claybourne Elder, who has performed on Broadway in Torch Song, Sunday in the Park with George and Bonnie and Clyde, delivered a sneak peek version of a song from Knoxville, “Outside Your Window,” backed by Ahrens, Flaherty and other musicians, in a moment from early in the show, when the family’s father, Jay, receives a 3 a.m. phone call that forces him to leave home to be at the bedside of his own possibly dying father. Elder will perform in a workshop in June 2019 here that precedes the 2020 premiere. Casting and production dates will be announced later. For more information, visit www.asolorep.org.